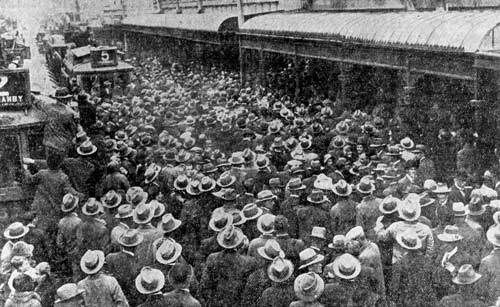 On 9 January 1932 hundreds of unemployed workers, frustrated and hungry from being denied relief from the government to buy food, marched on Wardell’s grocery store in George Street, Dunedin, smashing its front window. They attempted to break into the store but were repelled and dispersed by police. This photograph shows the attack on Wardell’s.